CHRIST THE CENTRE OF THE BIBLE. Philemon. PHILEMON - Christ`s Life within develops Compassion. This is a personal letter from Paul to Philemon. In the letter Paul intercedes with Philemon (who was an outstanding member of the church at Colosse), for a runaway slave by the name of Onesimus, who had stolen from his master and made his way to Rome. In Rome he had been brought face to face with Paul, and had found Christ as his Saviour. Onesimus became endeared to the Apostle by his devoted service. 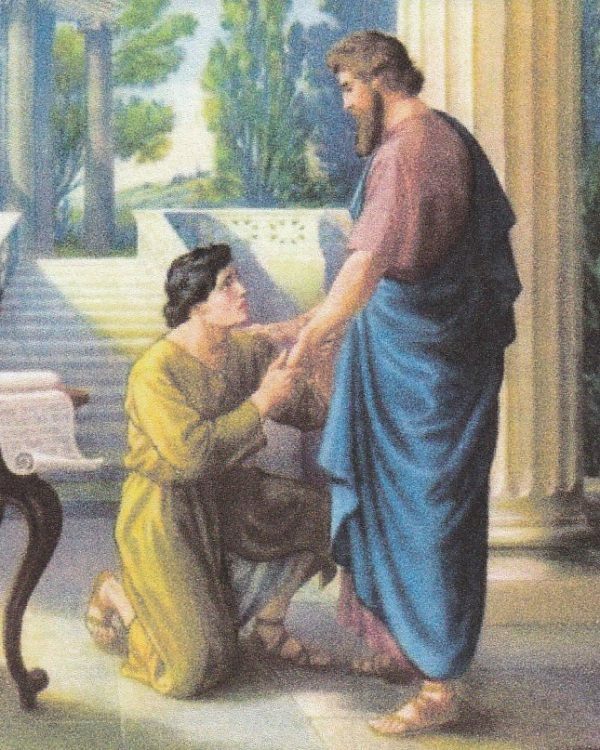 But Paul knew that Onesimus was Philomen`s lawful slave and so could not think of keeping him permanently. So Paul sends him home and pleads with Philemon to take him back. He makes himself personally responsible for the debts that Onesimus owes, asking that they be charged to his (Paul`s) account. He wished to save the runaway slave from the severe and cruel punishment he deserved according to Roman law. Paul feels that the slave must not encounter his out raged master alone. The sacrifice of personal rights for the sake of others is a Christ like characteristic which shines brightly in this case as emanating from the discomforts of a prison. It illustrates the Lord`s work on behalf of the sinner. Paul does not minimize the sin, but he pleads for forgiveness for the sinner on the ground of his own merit in the eyes of Philemon, his friend. This is the message of the gospel. For Christ bore our sins in His own body on the tree. This is what Christ does - takes the sinner`s place. Oneismus, whose name means `profitable` had robbed his master, but now after becoming a believer, will be returned now `profitable.` Christ makes a man profitable to others. Previous entry CHRIST THE CENTRE OF THE BIBLE. Titus. Next entry CHRIST THE CENTRE OF THE BIBLE. Hebrews. So true. Just shows that God is interested in everyone, no matter what station of life. And that He can change us, even though we have given up on ourselves. Isn't it strange - and to my shame - when I remember the amount of times I have read Philemon and never even thought of the illustration it was of Jesus' forgiveness toward us. Or I may have seen it and just forgotten over time, but I think I only ever meditated on the part Paul played in pleading for Onesimus before returning him to his master. Thanks for showing me the bigger picture.